This fall pumpkin dessert is truly magical. It's much more than just a cobbler, with qualities of a crisp and lava cake all rolled into one. There's a decadent caramel sauce that forms on the bottom of the dish, thanks to a special technique that calls for adding hot water right before you place it in the oven. 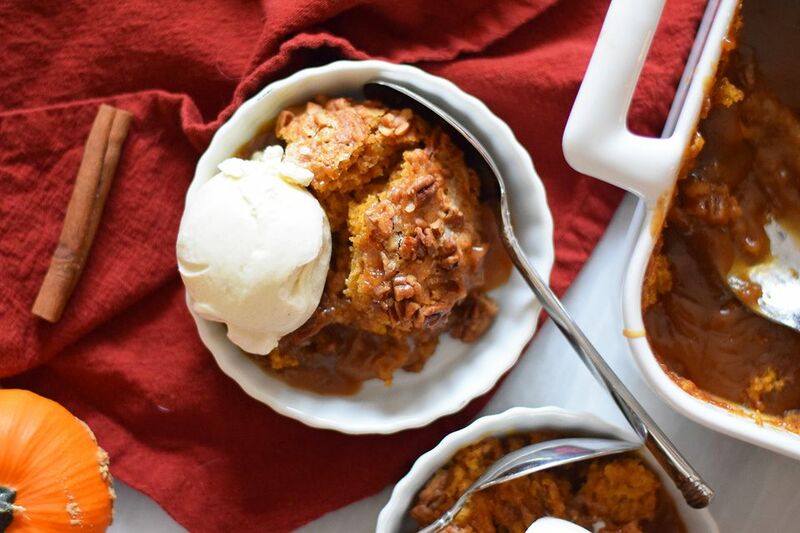 Made with pumpkin puree, cozy fall spices, and pecans, this cobbler is the perfect alternative to pie when you're looking for something different, but still special enough to serve on Thanksgiving. Make sure to bake it right before it's dessert time because that beautiful caramel appears only when it's hot and fresh out of the oven. You can make the batter ahead of time and place it in the casserole dish. Finish it with the topping and the hot water right before you're ready to bake. You can also halve the recipe if you're having a smaller number of guests over, but we have a feeling everyone will be asking for seconds. Whisk together the flour, baking powder, salt, sugar, and spices together in a large bowl. In a measuring cup, measure the milk and add the melted butter, pumpkin puree, and vanilla extract. Whisk it all until completely combined. Pour the wet ingredients into the bowl with the dry ingredients. Mix until well combined. The batter will be very thick. Pour into a 9x13-inch casserole dish (do not grease the pan). Place the dish on top of an aluminum foil-lined sheet pan. This will catch any drips in case it overflows while baking. Make the topping. In a medium-sized bowl, whisk together the sugars, ground cinnamon, and pecans. Wait to add the hot water. It will come at the very end. Spread the dry topping mixture evenly over the top of the thick batter. Right, before you're ready to place it in the oven, pour the hot water over the top of the batter evenly. Do not stir or mix—just place the pan directly in the oven after you add the water. Bake for 40 to 50 minutes, or until the center of the cobbler has set. Remove the cobbler from the oven. Make sure to enjoy immediately, so that the caramel sauce is perfectly smooth and warm (once the cobbler cools, the caramel sauce will part of the cobbler). Serve with ice cream or whipped cream and more chopped pecans!